Our research studies the incentive costs of China’s housing booms. We use the type and actual time stamps of 9.3 million credit card transactions by over 200,000 cardholders to detect non-work-related behavior during work hours. Employees respond to positive house price shocks with an immediate and permanent increase in their propensity to use work hours to attend to personal needs. Our estimate implies an elasticity of shirking propensity with respect to house price of 1.6. The effect is driven by homeowners, especially among owners with higher housing wealth. Further analyses point to negative productivity implications of the increased shirking. China’s housing market has experienced phenomenal growth since the early 2000s. There is an active discussion both in the academic literature and within policy circles on the real effects of housing booms. At the firm level, house price increases distract companies from their normal business activity, negatively impacting productivity in the real economy (Deng et al., 2015; Chen et al., 2017). A growing line of work also suggests the influence of housing booms on individuals’ labor market choices. A thriving housing market likely steers individuals’ educational and work choices, leading to both labor allocation and productivity implications for the aggregate economy (Charles, Hurst, and Notowidigdo, 2017). One effect that has not received much attention however is the impact of housing booms on the reduced effort individuals put into their work and the productivity repercussions. In a recent paper, Gu, He, and Qian (2018) looked into what is known as shirking behavior—when individuals reduce engagement with their work and spend unproductive time during working hours. Shirking behavior is prevalent in the workplace. A survey conducted by salary.com in 2014 found that 90% of American employees wasted time during work hours and close to 70% spent at least one hour unproductively every day. The same survey estimates the cost to employers in the range of several hundred billion dollars annually. In an incomplete market with uninsurable labor income risk, the precautionary savings motive incentivizes the supply of work effort. With house price increases, homeowners benefit from a large windfall of housing wealth, which provides an enhanced self-insurance mechanism against future labor market risk. The effective increase in the outside option in turn reduces workers’ effort incentives. Given the significant role of housing in an average household’s wealth portfolio, the negative impact of house price increase on work effort imposes motivational costs for firms, which has direct bearing on the aggregate economic growth. Shirking behavior is difficult to measure due to its elusive nature. To overcome this challenge, we measure time use at work by detecting non-productive activity during work hours. Using 9.3 million credit card transactions of over 200,000 credit card holders from a leading Chinese commercial bank, we make use of the time stamp (up to the second) of each credit card transaction and measure shirking by the occurrence of non-work-related transactions during work hours for an employed individual. We exploit the unique institutional setting in China’s land auction market and use the announcement that a land auction set a nationwide record for the highest per-unit land price (“Land King”) as a plausibly exogenous shock to the house price of the winning land parcel’s city. Land King announcements are commonly perceived by the public as positive indicators of local house prices. There are three Land King events that satisfy such criteria during our sample period: the three winning cities (dates) were Shanghai (August 27, 2008), Hangzhou (August 18, 2009), and Xiamen (September 8, 2009). Consistent with the common perception, local house prices in these three cities experienced a monthly increase of 5% on average in our sample period after the Land King announcements (based on house price indices constructed by Fang et al. (2015)). Moreover, we find that the timing of the three Land King announcements was unanticipated; by extrapolating the past house price growth rates, we would not have predicted these three cities to win Land Kings on those event dates. After the Land King shocks, employed individuals in the three shocked cities became about 1.7% more likely to use work hours to attend to their personal needs. The effect is economically large: compared with the treatment group’s pre-shock mean of 21.3%, the estimated average monthly response is equivalent to an 8% increase in the propensity. Employed individuals in the three shocked cities exhibit no different behavior in the month before the Land King announcements. On the other hand, we observe a significant response starting from one to two months after the Land King announcements (Figure 1). Moreover, the effect is persistent and (almost) constant throughout the 12-month post-shock period. If the estimated response is attributable to other unobserved local economic shocks, then we expect to see a similar response in the cities that are geographically close to the winning Land King cities. 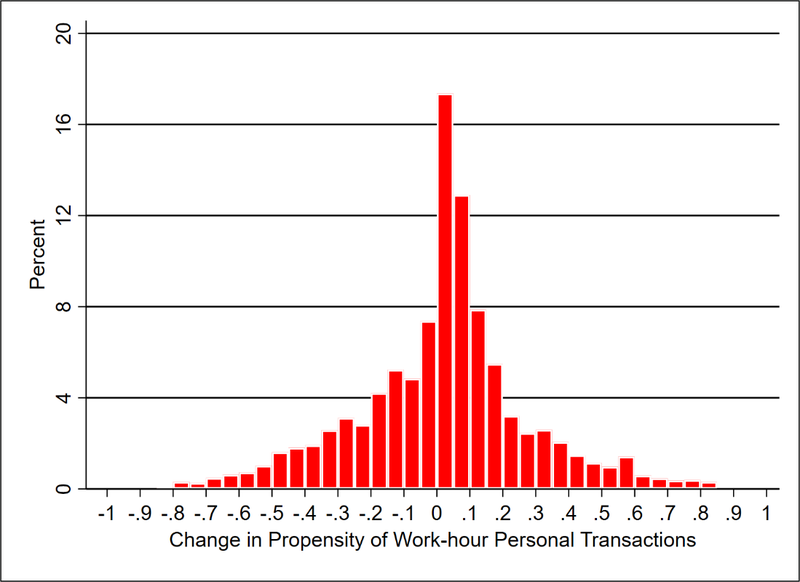 We find no change in the propensity of work-hour personal transaction behavior in the neighboring cities, which suggests the nature of the shock is specific to house prices. Does the estimated response reflect an overall increase in credit card use after the positive house price shocks? First, there is no evidence of a post-shock increase in credit card activity among the treatment group. Second, we also find no effect among those living in the three shocked cities who are not employed. This suggests that the effect we observe for the treatment group captures labor supply response rather than other behavioral changes in credit card use patterns. We also verify that the effect is not driven by outliers: 60% of the treatment group experienced an increase in their propensity to use credit cards for personal transactions (Figure 2). The prevalence of the effect makes it unlikely that the effect could be explained by individuals’ decisions to quit their jobs after the house price shocks. Consistent with the hypothesis that higher housing wealth reduces the precautionary savings motive and the cost of shirking, we find a strong response among homeowners, especially those with higher housing wealth (e.g., those with multiple homes). The effect for renters is indistinguishable from zero both statistically and economically. What do our findings imply for labor productivity? Is it possible that the treatment group maintained their productivity by working harder at other hours of the day? We find no evidence that the treated individuals moved their work activity to other hours of the day. Looking within the work hours, the results suggest that they became more likely to show up late for work and leave earlier at the end of the workday or before lunch. Moreover, we find a stronger effect among workers with lower work incentives, such as older people approaching retirement age—especially those who work in SOEs that have weak pay-performance sensitivity. In sum, the collective evidence provides support for an interpretation of increased shirking after the house price shocks with lower labor productivity implications. There is a growing body of literature on the labor market consequences of housing market conditions. Mian and Sufi (2014) find that the decline in housing net worth played a key role in explaining the sharp decline in U.S. non-tradable employment between 2007 and 2009. Charles, Hurst, and Notowidigdo (2017) study how the national boom and bust in the U.S. housing market affects college attendance choices, leading to potential labor misallocation implications. Sodini, et al. (2017) show that homeownership has a positive but short-lived effect on earnings, consistent with a debt-induced labor supply increase. We directly contribute to the literature by providing the first empirical analysis on the effect of housing booms on worker effort. Our main estimate suggests an 8% monthly increase in shirking propensity in cities that experienced a 5% post-shock monthly increase in house prices. This implies an elasticity of shirking propensity with respect to house price of 1.6. In this respect, our results also echo existing research that documents the corporate sector’s distraction from their normal business activity after significant house price increases in China (Deng et al., 2015; Chen et al., 2017). Overall, our paper points to an understudied yet important real consequence of house price increase, with direct implications for labor productivity and economic growth. This is particularly pertinent for China, which has experienced an unrivalled growth trajectory in the housing market since the early 2000s. Charles, Kerwin K., Erik Hurst, and Matthew J. Notowidigdo. 2017. “Housing Booms and Busts, Labor Market Opportunities, and College Attendance,” American Economic Review, forthcoming. Chen, Ting, Laura Liu, Wei Xiong, and Li-An Zhou. 2017. “Real Estate Boom and Misallocation of Capital in China,” Working Paper. Deng, Yongheng, Randall Morck, Jing Wu, Bernard Yeung. 2015. "China’s Pseudo-monetary Policy," Review of Finance, 19: 55-93. Fang, Hanming, Quanlin Gu, Wei Xiong, and Li-An Zhou. 2015. “Demystifying the Chinese Housing Boom," NBER Macroeconomics Annual, 30(1): 105-66. Gu, Quanlin, Jia He, and Wenlan Qian. 2018. “Housing Booms and Shirking,” Working Paper. Mian, Atif, and Amir Sufi. 2014. "What Explains the 2007–2009 Drop in Employment?" 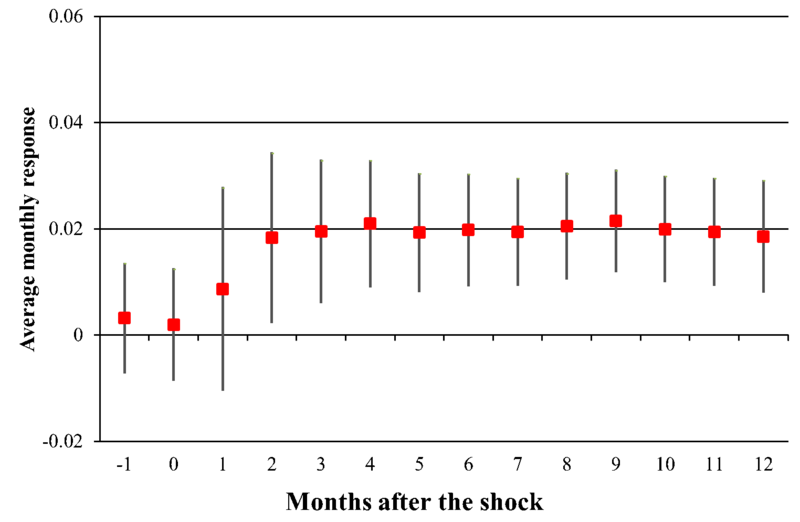 Econometrica 82(6): 2197-2223. Sodini, Paolo, Stijn Van Nieuwerburgh, Roine Vestman, and Ulf von Lilienfeld-Toal. 2017. “Identifying the Benefits from Home Ownership: A Swedish Experiment,” Working Paper.